The suicide attacks were the deadliest assault in the country for five months. A SUICIDE ATTACK on a Shiite Muslim procession in Pakistan overnight killed 35 people in the deadliest assault in the country for five months as Muslim leaders gathered for a rare summit in Islamabad. Police in the garrison city of Rawalpindi near the capital said the bomber blew himself up when he was stopped for a security check as Shiite faithful commemorated the holy month of Muharram, a magnet for sectarian attacks. Police used lamps and torches to work through the night, as rescuers ferried casualties to hospital, where critically wounded patients died during the night. As well as the 35 people killed, police rescue spokesman Deeba Shehnaz told AFP that another 62 people were wounded, including eight children. Attacks on Wednesday overall killed 35 people. The Rawalpindi attack was the deadliest bombing in Pakistan since 29 people were killed in the northwestern tribal district of Khyber on June 16. It was also the worst attack targeting Shiites since February 17 when a suicide bomber on a motorcycle killed 31 people in a largely Shiite area of Parachinar in the northwestern Kurram district. The Pakistani Taliban claimed responsibility for the attack, another explosion that killed two people near a Shiite mosque in Karachi, and attacks targeting security forces in the northwest. Spokesman Ehsanullah Ehsan told AFP that Shiites were targeted because they are “engaged in defiling the Prophet”. The Taliban have been fighting an insurgency against security forces since 2007. Rawalpindi is adjacent to Islamabad, where thousands of extra police and paramilitary forces have been mobilised for the Developing 8 (D8) summit starting at midday on Thursday (0700 GMT). Egypt, Iran and Turkey are among the countries joining the summit of mainly Muslim nations which is meant to promote trade and investment. But Israel’s latest offensive in Gaza is set to loom large, even if a truce is now in effect. The ceasefire was agreed in a deal between Israel and Palestinian group Hamas that was announced in Egypt on the eighth day of violence in and around Gaza that has killed at least 160 people. Egyptian president Mohamed Morsi — who was thanked by the United States for helping to broker the Israel-Hamas deal — had been slated to join the Islamabad talks but state TV in Egypt said he would now stay home to monitor the truce. Pakistan wants the summit to strengthen its international standing and help “remove misconceptions (about the country) created in a section of international media”, a government statement said in the build-up to the gathering. But a long day of militant violence on Wednesday was an unwelcome reminder that Pakistan remains in the grip of unrest largely orchestrated by homegrown Taliban extremists bitterly opposed to the country’s US-allied government. In northwest Pakistan, four police died when gunmen ambushed a patrol in Bannu district, police official Nisar Ahmed Tanoli said. A roadside bomb elsewhere killed another police official. Because of such violence in the years since the September 11 attacks of 2001, Pakistan has rarely had a chance to host international gatherings, and the government had hoped to use the D8 summit to present a different image. Email “Pakistan suicide attacks kill 35 as leaders meet for summit”. 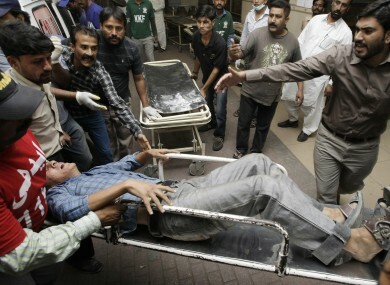 Feedback on “Pakistan suicide attacks kill 35 as leaders meet for summit”.